So much of the focus on Robert Rose’s life centres on the tragic turn of events that followed one night in February 1974, but what should never be lost was what came before it, and what fine young sportsman he was. For a moment, forget about what might have been, and think about what was. Robert Rose was born to be a sportsman. He had that natural aptitude from the start; that passionate competitiveness; and that determination of spirit. He even had the pedigree. The eldest son of Collingwood champion Bob Rose and his wife Elsie always seemed destined to wear the black and white. But he had to earn those stripes as much as anyone else, as well as endure the endless comparisons with his father that he could never hope to live up to. He even had to put up with conjecture about whether he had had an easier passage than others because his father was his coach – even though he hadn’t. He was almost a natural from the start. One of the earliest photos of Robert with a football in his hands – detailed in his brother Peter’s remarkable book, Rose Boys – shows him at full stretch kicking the ball, his technique already crafted by endless practice, his face etched in endeavour. He is not yet three years of age. Behind him, his father watches on with careful attention, and, one senses, more than a little pride. This wasn’t just a shot for the camera. It was part of a bond they would share forever, one that would be tested over time, but never weaken. Years later, in an interview the pair did for the Age in 1971, they spoke of the countless hours put into honing those skills. Bob would recall his “unobtrusive grooming” of Robert in the backyard in the early 1960s, when he was coach of Wangaratta Rovers, just ahead of his return to Victoria Park in 1964 to coach the Magpies. 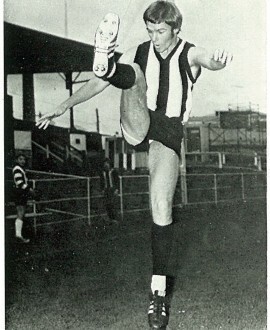 Robert joined Collingwood in 1968, playing in the under 19s, and made the supplementary list the following season. In that year, 1969, he began training with the seniors, and with that came even more attention. The Herald ran a headline “Another Rose Blooms for Collingwood” after one of his first practice matches. It detailed how he was likely to carry on the family tradition, following on from his father, and his uncles Kevin, Bill and Ralph in playing senior football with the Magpies. Another uncle, Colin, had played with the reserves. Rose was only 18 years and 114 days old when he made his VFL debut, in Round 9, 1970, in the same game that West Australian recruit Peter Eakins played his first game with the club. That news came with the headline: “Magpies select Coach’s son.” But there was little doubt Rose had earned his spot. In an interview with Lou Richards, his father’s former teammate, he said he wasn’t fazed by the famous name he shared with his father. Rose was named as one of the reserves in that first game and he only came onto the Windy Hill ground late in the last quarter, recording two kicks and one mark in the six-point loss. Four games came in that debut season of 1970, none of them after Round 14, and he was a spectator when his father’s team gave up a 44-point half-time lead to lose to Carlton in that remarkable 1970 Grand Final. Playing mainly as a utility/half-forward, Rose found a more permanent position within the Collingwood team in 1971, even if the early part of the season he was primarily used as either 19th or 20th man. But the confidence derived from his first full game – Round 9, 1971 against South Melbourne at Victoria Park – seemed to further validate his worth to the team. He had 21 disposals, took eight marks and kicked two goals. “I knew I had to play well to stay in, and I went reasonably well against (South Melbourne) Eric Sarich,” he said. “And I remember my first goal in league football. (Graeme) Jenkin handballed and I shot it through. It helped the tight feeling to fall off, and you could breathe easier. But even Robert conceded that no matter what happened, he could never reach the lofty heights that Bob achieved. Like his father, Rose excelled at dual sports. Bob had been a talented boxer as well as an exceptional footballer. Robert was a good footballer, and seemingly had even more talent as a cricketer. He would come to play in two Collingwood district premierships, as well as represent Victoria as a right-handed middle order batsman. Perhaps Rose’s best VFL game came in Round 20, 1971, when he kicked 4.3 and had 29 disposals the next time the Magpies took on the Swans. But the season ended in disappointment when the Magpies bowed out of the finals with a semi-final loss to Richmond. That would be his father’s last game as Collingwood coach in that tenure. Bob resigned and he took on the Footscray coaching job in 1972. Robert remained a Magpie for another season, but managed only six games that year. His 26th and last game for Collingwood came in the 1972 first semi-final loss to St Kilda. Seeking a change, he tried to join his father at the Bulldogs, but a transfer was initially refused. He didn’t want to fuel the fire by saying that he no longer wanted to play under Collingwood coach Neil Mann, but that was the case. So he played for a time for his uncle Kevin at Prahran in the VFA before the Magpies finally gave their permission for him to cross to Footscray. He was married by that stage, and had a young daughter, Salli. Nine more games came with the Bulldogs – wearing his father old No.22 for the first time – in the second half of the 1973 season, including a career-best 30 disposals in his first match with the club. That summer produced his best return for Victoria, including scoring an unbeaten 118 runs against Queensland at the Gabba, and playing an important role in helping Victoria to secure another Sheffield Shield title. Rose turned 22 on February 5, 1974. Nine days later, he and two friends had enjoyed a day at the Ballarat races, but on their return, the car in which they were travelling flipped over on the Western Highway. His mates walked away from the wreckage, but tragically Rose’s spinal cord was severed. There were initial fears he would not survive. But the same determination he showed in his sporting pursuits crossed over into his recovery and stayed with him for the remainder of this life, despite his quadriplegia. Robert Rose remained a fixture around the Collingwood Football Club for the rest of his life, with his devoted father religiously taking him to football games and cricket matches across Melbourne. The Robert Rose Foundation, which provides support to those with spinal cord injuries and their families, was founded in his honour, and Collingwood and the Western Bulldogs still play for the Robert Rose Cup.